FRIDAY. Hello from sunny Barcelona! Woke up at 4.30 yesterday morning, headed to the airport and went to Barcelona for an event I’m going to tonight together with Andy! Will be posting a photo diary when I get home this weekend, until then, follow me on instagram (carolinaengman) for lot’s of pictures! This entry was posted in Fashion and tagged Andy Torres, Barcelona, photo diary by Carolina Engman. Bookmark the permalink. Ahhh fun! :) Love you girls, have a great time and can’t wait to see photos! You girls look lovely. I love your sunglasses! Have a great time in Barcelona!! Pretty gals! 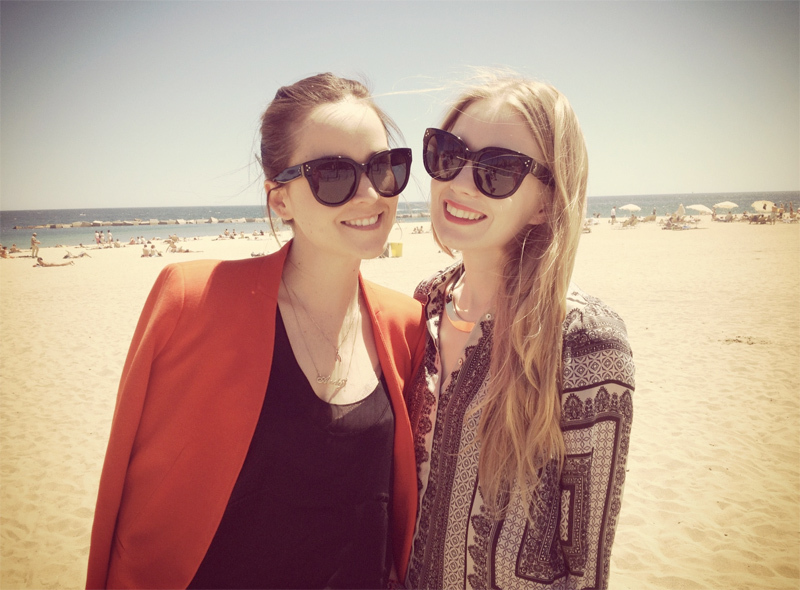 :D The beach looks beautiful and I adore your Celine sunnies! Wow! Lovely picture, so chic! You girls are so cute in your matching sunglasses! So great! I’m going to Barcelona next week! Can’t wait! Your friendship seems so lovely. following you on instagram so i saw all the photos!! Hoooraaay!I am dreaming about Madrid!Especially Santiago Bernabeu!ahave a lovely time! Love your sunnies, you are so beautiful both of you! Can’t wait to see more photos. beautiful photo! so jealous, wish i was on a beach! Enjoy you stay here in barcelona! I am going to Barcelona on Sunday! Can’t wait. You and Andy look remarkable! Have fun! Oh wow, wish I was there. Sunshine! Hace fun un my homeland! Have a fab trip! Already catching your instagrams! Wow you both look great!!!! Love this pic! You look gorgeous! Great! I’ll be following on instagram! Oh gosh, here comes the rain of jealousy which will probably only worsen after the photo-spam post. ;) Have fun in the meantime, though I’m sure you will! wow, two beauties, love the capture! Love those sunglasses, so adorable! I love Barcelona. Such great city! In luv with your glasses! Girls, you look amazing! Have fun! Great photo of you both! Have fun in Barcelona! have fun! So jealous barcelona is amazing. I love the patterned top,looks perfect for a trip in the sun! Love the Zara blouse you are wearing. Barcelona is incredible – enjoy! You look both so cute with the same sunglasses! :) This in Barcelona must me an amazing experience,I am so curious about your projects for the day. You look amazing!! Love both of your sunnies! Lucky, lucky things! Wishing I was there..
You should choose smaller sunglasses. Will follow you on instagram. I have your shirt… I love it! I love Barcelona. Enjoy it!! I would love to be at or near the beach, too!! oooh I´m jealouse! hihi Have fun girls! Like the picture! Have fun there! heey, Im going to Barcelona too! :) I can’t wait. definitely one place on my list to visit. love your blog! Lovely picture, you guys look so happy! Not so strange cause I would be happy being in Barcelona!! http://bububoots.blogspot.fr/ the blog of a girl who tries to lose weight! two lovely bloggers! have a great time!!!! I love your Céline sunnies, Carolina & Andy! Beautiful!! I want to go to Barcelona so bad! U guy´s look great! what a great blouse and shades!Pretty Photo! Barcelona is a place to be, have fun! You two are great!! love the pic!! Njut lite för mig med !!! Ooh girls! You both looking nice with those sunnies! I am so jealous! Barcelona would be the best place for me to go right now, while it is not that warm at my town. You are both so cute, but I really like your shirt Carolina :), it’s simply chic! Check out INfluenceWithStyle.org for the latest trends, outfit diaries, styling tips, and fashion INdustry INsight! You look amazing! Great photo!